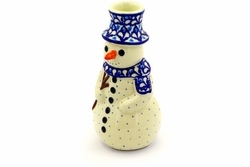 Bring a touch of art to your table with this hand-finished Candle Holder Snowman. A wonderful way to add a whimsical touch to your home at Christmas. You can use these stoneware Candle Holders alone or pull them out for a dinner party to impress all of your guests. Each stoneware candle holder is a unique creation by talented artisans from Boleslawiec, Poland.